The Carnegie Math Pathways engages and supports individual educators and whole institutions to transform the mathematical teaching and learning experience for all students. Designing courses for the realities of our students’ lives in order to give them the best chance for success. Shorten the math sequence and reduce transition points for students placed in remedial math in order to help them achieve college math credit and reach their academic completion goals. Offer a productively challenging curriculum relevant to students’ lives and areas of study. Integrate productive persistence student supports into the curriculum. Statway and Quantway are taught using common curricula, assessments, an online platform, and innovative instructional approaches. Statway is focused on statistics, data analysis, and causal reasoning, combining college-level statistics with developmental math. It is designed to teach mathematics skills that are essential for a growing number of occupations and are needed for decision-making under conditions of uncertainty. Quantway is focused on quantitative reasoning that fulfills developmental requirements with the aim of preparing students for success in college-level mathematics. The goal of Quantway is to promote success in community college mathematics and to develop quantitatively literate students. Supporting powerful mathematics learning and students’ persistence and engagement. The Pathways represent an innovative approach to developmental mathematics learning and teaching. Along with a set of revised, accelerated curricula designed to be relevant to students academic and career goals, Statway and Quantway are taught using a research-based pedagogy focused on collaboration, fostering deeper learning, and community building in the classroom. Statway and Quantway are designed to be taught using a student-centered approach that engages students to actively and collaboratively problem solve. Many students enter into math courses with a belief that they are not a math person or that they don’t belong in the classroom at all. Statway and Quantway instruction is embedded with student support practices and tools to counter socio-emotional factors that limit success. Known collectively as Productive Persistence, these focus on helping students develop a growth mindset toward learning, build strong learning strategies, and nurture community and belonging in the classroom. Sustaining and improving student success outcomes. Five years of data in the classroom show that students in Quantway and Statway succeed at a higher rate and two-to-three times more quickly than their traditionally remediated peers, out-perform them in subsequent quantitative courses, transfer at significantly higher rates, and make lasting gains in key socio-emotional and motivational factors that support success. We’ve been able to sustain these outcomes through a holistic design. More than just a set of curricula, the Carnegie Math Pathways also encompasses the following. Working as a community enable our faculty and administrative members to collaborate with a community of peers to share learnings as well as access and contribute to the ongoing development of evidence-based resources to support student learning and success. For Statway and Quantway to having a meaningful impact on student completion and success, institutional coordination is necessary to ensure the effective launch and sustained implementation of these programs on a campus. Our network provides resources and coaches to institutions to assist with strategic planning to adopt and scale Statway and Quantway on campuses in order to optimize student success. We recognize that teaching is complex and that learning to teach differently is particularly challenging. Thus, we see faculty development as a process not a single injection, and that requires a long-term commitment. We provide support to faculty through intensive initial preparation, ongoing mentoring, online training and forums, and in-person meetings. Data collection and analysis are at the heart of the Pathways. At the classroom level, instructors receive information specific to their students’ mindsets, feelings of belonging, and background mathematics understanding to help faculty troubleshoot and address students’ needs from the beginning of the semester. Faculty have a sense of how students are engaging with both the math concepts and their engagement throughout the semester and can adapt their practices and provide additional, targeted support to students as needed during the semester. Reports on students’ progress with their homework also support faculty helping students engage in deliberate practice. A sample “stock and flow” diagram representing students in a classroom that are at risk, moderately at risk, or not at risk on the Growth or Fixed Mindset indicator. As a networked improvement community, all Quantway and Statway students take common surveys and assessments. These shared metrics not only support teaching in real time but highlight variation in process and outcomes. This variation supports deeper research around bright spots and areas to improve across the network. Administering a common summative assessment across Quantway and Statway allows all network members to see the impact this systematic approach is having on student success and where the network should focus improvement efforts next. Success data of a sample college teaching Statway and its success rates compared to the national network. 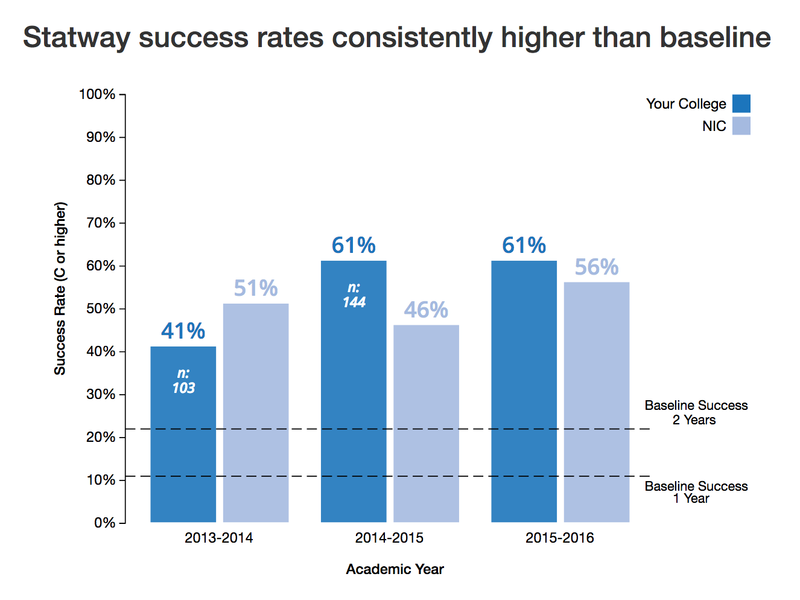 The baseline success rate represents the percent of developmental math students at the college who achieved college math credit in 1 and 2 years prior to implementation of Statway & Quantway.